Sunset over the Seneca River in Baldwinsville, New York on Friday, June 26, 2009. 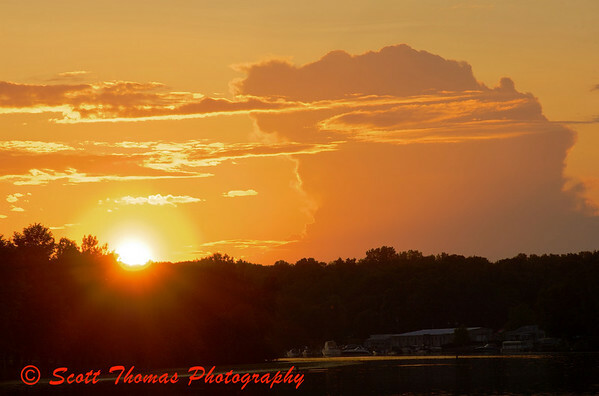 This entry was posted in Nature, Weekly View and tagged baldwinsville, clouds, new york, Photography, seneca river, sunset, water. Bookmark the permalink. I like golden sunsets. They . . . melt . . . rather than flame. This is a fine example! Cant beat a nice sunset. I like this one too. I have been reluctant taking pictures directly against the sun but here it is very good. Such a beautiful sunset. Lovely warm colors and beautiful setting.